Amanusa Resort is one of 18 Amanresorts, and this one prides itself on its balance of physical beauty and spiritual roots, according to founder Adrian Zecha. At Amanusa you’ll find the art of the bale, perfected. 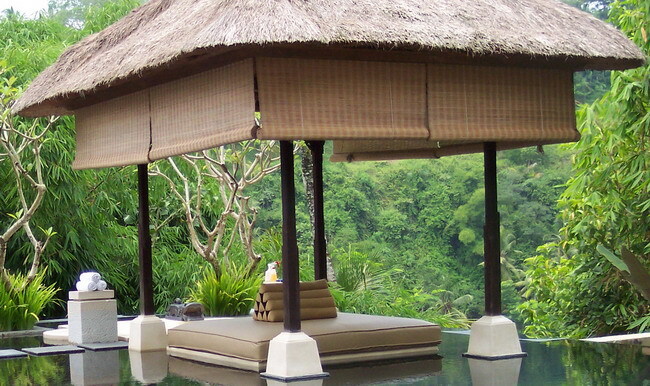 Bales, known as cabanas or gazebos in other cultures, are a kind of traditional symbol of Bali. They’re usually made of local teak or coconut wood and topped with a thatched roof; Amanusa makes the most of its bales by creatively adapting them to the special needs of refuges from a stressful world, who start to relax just by spotting the nearest bale awaiting them on the shoreline. A bale can be used as a private retreat, a room of one’s own just for reading, writing postcards, meditating, napping,or just plain decompressing. Private bales are each fitted with plush mattresses and thick roll cushions, according to resort personnel. Visitors can roll out a mattress, stretch out, and relax, in between dips in the safe lagoon or leisurely strolls along the white sand beach, and then return to the bale for refreshments or a light meal. (Each beach bale is outfitted with a ceramic pot of frangipani water to wash away the sand.) Visitors can also enjoy a massage in the privacy of the bale to the accompanying sound of gentle waves of the Indian Ocean. The trained Amanusa masseuses combine Swedish and traditional Balinese massage techniques. For more active guests, the tennis center provides two all weather tennis courts, and so there’s another bale between the courts for shady breaks, complete with iced chrysanthemum tea and other refreshers. Traditionally, each Balinese village has a larger bale which serves as a kind of community gathering center, and Amanusa resort has borrowed a bit of this authentic culture for its luncheon facilities, a larger, dining bale with its rattan-screen windbreak. After lunch, during low tide guests can walk out to the coral reef for a quick dip to look at the teeming fish; athigh tide, they can make use of the snorkeling equipment to swim out and explore. 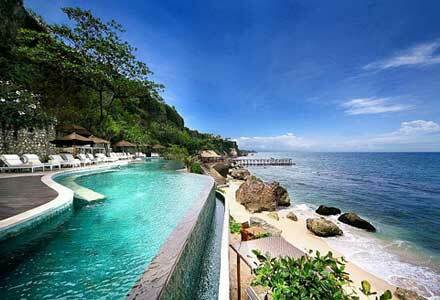 But there’s more to Bali than its bales. And that includes the more conventional aspects of luxury vacations. At Amanusa, each of the 35 spacious suites mixes up a peaceful palette of serenity with smoothly blended crème walls, beige thatched ceilings, and mahogany furniture. The bathroom beckons to guests once they catch the hint of the scent of frangipanis evoked by the hot bath water awaiting in the marble-tiled sunken bathtub. 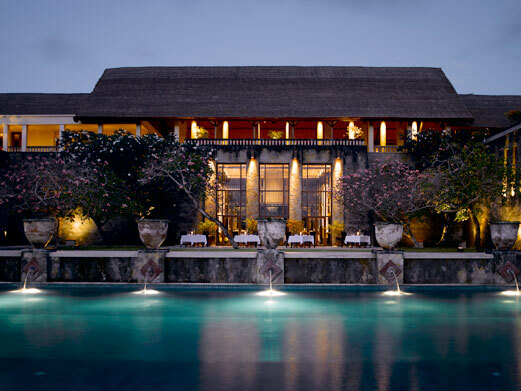 Glass doors open up to phenomenal views of the sparkling crystal-blue waters of the Indian Ocean or the rolling glistening fairways of the Bali Golf and Country Club. Peru: land of the ancient Incas, home to some of the most breathtaking landscapes on earth, and tourist destination like no other. Hugely popular with adventurers, people on gap years and those wanting to escape from reality for a while, Peru is synonymous with culture, adventure and above all, nature. You have to see it to believe it, and once you’re there you’ll never want to leave! Situated on the western coast of South America, Peru is one of the most ecologically, culturally and historically diverse countries in the world. From arid plains to high mountains and tropical rainforests, as a holiday destination it’s definitely one of the best as there’s so much to explore. One trip isn’t enough, to see Peru for all it’s worth, you’ll need to return time and time again! Unlike most other countries in the region, the climate of Peru is not exclusively equatorial or tropical. Thanks to so many different types of area, the climate changes from blisteringly hot in the lowlands to freezing cold in the high Andes and incredibly humid in the Amazonian jungles. It’s therefore incredible difficult to give an average temperature to expect, so the best advice is to plan where you’re going and prepare for all conditions accordingly. The great thing about Peru is that most of the country is untouched and most of the settlement is comparatively little of the land. This means once you get out of urban centres you can really become one with nature and experience everything the country has to offer. Spend a week taking in the impressive culture and cuisine of the capital, Lima, and then another in the wild. Peru is a country of dichotomy, and it’s absolutely incredible. Whether you’re looking for adventure or simply want to relax and recharge your batteries, Peru has everything on offer. One of the hottest spots for people on gap years, TEFL placements and adventure holidays, trekking through the rainforests or climbing in the Andes are firmly on the agenda along with other activities such as paragliding and canoeing down one of the many rivers or teaching English in city or rural schools. If adrenaline is what you seek, there’s no better place than Peru. Similarly, the miles of untouched beaches lined with palm trees paint a picture of paradise that’s too good to miss! Does your vacation look like this? You and your family go off to a travel destination by plane, where you’ll stay in a hotel and basically go out to eat somewhere that isn’t your home. Occasionally, you’ll fall asleep exhausted from walking around all day around a destination that you’ve been to many times. If this is the case, one thing is clear — you definitely need a more exciting trip. Instead of doing the same old vacation where you go to a destination just to walk around and not have any fun, you will want to make sure that you’re actually thinking about a completely different type of vacation. A cruise gives you the best opportunity to really see different countries in Africa, especially along what is known as the Gold Coast. You won’t have to worry about safety issues, because you will always have knowledgeable experts surrounding you and informing you of where to go and where to shop. For the more adventurous people out there, you might feel like this will hinder your ability to really see the best that Africa has to offer, but the reality is that you really won’t have that problem at all. You will just need to make sure that you follow your guide’s advice — this will give you the best chances of really building a great vacation. Booking an African cruise is something that you will want to do right away. This type of cruise generally attracts a lot of attention, and this means that spots tend to fill up quickly. However, don’t let the details take you away from what really matters — a great cruise right at your fingertips if you just reach out and take it! What type of vacation is that? Well, an African travel vacation is actually a great idea. You can explore Africa in a safe manner by taking a cruise where trained guides will show you the best that Africa has to offer. You’ll also have a great set of meals on the cruise ship that will definitely give you something to write home about. This is the type of trip where failing to bring a digital camera is truly a crime! And yes, it has to be a digital camera, because you’ll have too many opportunities to take pictures that you will not want to even dream of doing something else. Disneyland Paris is one of the most visited theme parks in the world, and millions of people flock there every year with their families to revel in some of the best entertainment and activities from the magical world of Disney. It was originally called Euro Disney resort after opening in April 1992, however with the increased success of Disney World in Orlando, the name was changed to Disneyland Paris. Located just outside the city centre, Disneyland Paris offers an abundance of rides as well as two massive theme parks. However despite it’s expected success, the theme park only started making profit in 1995, three years after it opened. In 2009, Disneyland Paris recorded record crowds, with over 15 million people flooding the gates in a single year. It also won the award for the most visited attraction in Europe in 2010. Let’s take a look at some of the things to consider when booking your holiday to Disneyland Paris this year. From cinemas and restaurants to fun fares, rollercoasters and golf courses, there are so many things to experience at Disneyland Paris that you won’t know where to start! When it comes to your children, one of the first stops they’ll want to make is at the theatre, where they will come face to face with some of their favourite Disney characters. After the show, they’ll even get to shake Micky Mouse’s hand and get an autograph. If you’re thinking about staying at the resort itself, then you’ll have a variety of accommodation to choose from. With seven major hotels, as well as a number of self-catering apartments around the complex, there’s accommodation to suit every budget. Paris is only 20 miles away from the resort too, so you could easily take a train and visit the romance capital of the world for a day. Just like any major holidaying destination, there’s a peak season and an off season. Christmas can get extremely busy in Disneyland Paris, so make sure you book everything well in advance, from your flights to your accommodation. Prices to the theme park will also be at their highest during this time, so expect to pay a small fortune to get inside. Make sure you keep checking back with the website throughout the year, as there will be special offers for short periods of time. If you’re looking to save some money on your trip to Disneyland Paris, then you’ll want to book in the off season, which is typically the winter months. Here, the ticket prices are at their lowest, and accommodation can be pretty cheap too. One of the negative points about Disneyland Paris is the food; let’s just say it’s not the best. To be honest, you don’t go to a theme park to have a 5-star meal, so expect to be unimpressed when dining in any one of the restaurants on-site. One of the best ways to eat well in Disneyland Paris is to pack your own lunches and take them with you. If you’re trying to figure out where you’re going to travel next, but you’re just feeling frustrated…I know the feeling. There was a point where I felt like I had traveled all over the place. I had seen perfect ski slopes, bi mountains, beautiful beaches, hot sun…you name it, I had been through it. It was time for a change, but I just didn’t know what. I found that I honestly needed to step back and think about a domestic vacation. Some people are a little wary of going with a domestic vacation, because they feel like they need to be constantly going to far off places. Yet there’s something about appreciating and accepting the beauty that’s right in our backyard. Take it as a chance to really check out that new restaurant that just popped up, or try to look at the new bookstore. It’s not going to be a traditional vacation, but think of the massive upsides. You’re not going to have to pay for a big hotel to stay in. Accommodation is one of the top expenses that you have to deal with when you’re looking at hotel life. So getting rid of that is absolutely wonderful. What about when you’re really trying to evaluate other places? What if you’re looking at going somewhere that’s really fun but out of your price range? There’s nothing that says that you can’t just take the experiences that you wanted to have abroad and have them at home. Treating yourself to wonderful experiences can be tricky at home, but it’s doable. Free time is something that’s precious. If anything, resting around the house isn’t a terrible idea. We all need to do things to address our stress levels. If you’re just going to lay around and hope that everything gets better, then you’re going to be in for a really bad time. It’s going to be up to you to design a vacation that really meets your needs. Anything less just doesn’t make sense. So, where does a domestic vacation really lead? It’s truly up to you. There’s nothing that says that you have to stay in your same town. You might make day trips to other towns around you and check out pieces of their history. That can be fascinating, and many history buffs travel the world for this reason. But you can’t ignore the fact that every town has its own local history. Explore the world around you on your terms, save money, live better, and have a great time? Sounds like paradise to me! If you’re thinking about trying to get on one of those last minute cruises before the summer finally waves goodbye and blends into fall, don’t worry — you are definitely in luck! The truth is that cruising is for everyone, and there’s truly no wrong age when it comes to getting on the cruise ship. You just need to make sure that you’re arming yourself with the right information. If you think that cruising is only for young people, you really might be surprised how many senior citizens you’ll actually meet. There are plenty of activities on a cruise ship, and no one is left out of anything. You’ll feel right at home with everyone else. It’s all about your comfort, when you really start looking at it. You don’t want to feel like everything is coming down on you, but you definitely want to be able to live your life on your own terms. Getting away from all of the stress plaguing you at home is definitely a good thing. You can sit back and enjoy the best years around — your golden ones. On the other hand, if you’re someone that’s relatively young, you might have heard that cruising is really for old people…unless you’re getting married. Thankfully, we have good news for you as well. There’s plenty of people that go and get on a cruise ship, even when they aren’t looking to celebrate a wedding that just past. It’s up to you to figure out what you’re going to do with your time. A cruise is affordable, and a great way to take the stress off you for other things. A lot of people worry about planning their holiday tour, and a cruise ship takes care of that for you. Think of it from the right perspective — there’s really no worrying to do. You get to rest easy knowing that highly trained professionals have spent hours putting together things for you to do. The hardest part of your day will be to figure out what to really do first. Do you want to rest inside your room, or do you want to catch some sun? Don’t forget the sunscreen, those summer rays are intense while you’re out at sea! There’s a cruise line for everyone, and it’s really not as expensive as you might have been told. If anything, cruising is relatively cheap when you step back and look at everything that you can get with it. Why not check it out today, while it’s still on your mind? Don’t Overlook Ibiza For Summer Fun! Summer is still going strong — even though it feels like fall might be around the corner. If you’re still trying to squeeze in a summer trip but you wanted to wait till things cooled off, why not start now? Of course, you might not be sure where you actually want to go. That’s perfectly okay. We have a new one for you that’s been around for a while: Ibiza! The island is well known for a big, swinging lifestyle, but that doesn’t mean that you necessarily have to join in. You can always make sure that you settle in to enjoy yourself — and we have the exact travel guide you need. Let’s cover the highlights. You might need to pack a lunch but we promise you’ll get the information you need before you book. So, let’s start at the beginning: Ibiza is an island of Spain, part of the Balearic Islands chain. The island isn’t terribly big — about 42 km long at the most. Every official sign on the island is in Catalan, but the locals will speak either Castilian, English, or German. So if you’re an English speaker, don’t feel like you’re automatically going to be out of luck. There are plenty of opportunities to speak up and get help. It’s a tourist island, you know. Flying in is pretty much the preferred method of getting on the island, and there is an airport. If you’re going to get around on the island, you definitely want to go with public transportation. We don’t suggest driving, because there are way too many crazy drivers. It’s not just us telling you a story — there really are a lot of scary accidents. You’re a LOT better off going with public transportation, and if you do decide to rent a car, you need to make sure that you’re watching for EVERYTHING that could possibly happen. We don’t mean to stop the party, but there are some things that you have to think about as a tourist. Many tourists come to party, and that means that they are going to be drinking. Some of them may still end up behind the wheel of a car. Does that mean that you should pay for their stupidity with your life? Not at all. The local police force does try to crack down on this, as it’s a threat to the safety of everyone on the island, tourist or otherwise. Taking Your High End Valuables On Your Next Trip – Bring Proof, Too! One of the time-tested rules of travel is that you try to avoid taking high end valuables with you on all of your holiday trips. It’s just too easy to get your things stolen, and insurance companies generally have nothing good to say if you file a claim based on this. However, there are still some people that want to add a little bling to their trip. Can we blame them? Of course not. It’s better to make sure that you’re going to be looking at getting the right appeal to your trip, but you still need to ensure that you’re going to be looking at all of the right things at the right time. You see, it’s possible to take along valuables that you really want to show off. If you’re going to be attending a black tie dinner in another country, you probably want to wear a watch that your family has had for the last 50 years, even if it means that a thief would find it appealing as well. The truth is that you need to make sure that you have a higher form of travel insurance than the run of the mill cheap stuff that you find online. If you can alert the insurance company to your itinerary, you might be able to get them to cover the valuables of your choice. Yet it doesn’t just stop there. You also need to make sure that you’re going to be looking at getting your security up as high as possible. Don’t take your eyes off your bags and make sure that you keep your valuables out of sight until the last possible second. This includes money. Do you really need to let everyone in your host country know that you have money? Absolutely not. It’s only going to make you a target for theft. The hotel of your choice should also come with a room safe. If you don’t have this option, you need to look around for a tight safe that you can use and take with you when you’re finished. It’s not going to be as good as a safe that’s nailed into the wall of your hotel, but it can come close enough. Again, it cannot be stressed enough — if you’re going to take high end valuables, you need to make sure that you’re covering as many of your bases as possible. Don’t forget to bring proof that you really own it so that you don’t end up looking like you stole something yourself. This hasn’t happened as much as it used to, but customs people can still be suspicious if you have tons of valuables on you, because most tourists don’t travel this way. Be prepared for questions, but don’t get nervous. You have all of the power to change your life, when you really think about it. Good luck with everything and don’t be afraid to show off a few select jewels… if you must. Look, we’re big travel fans. And we believe that it’s time to definitely see everything and anything that this world has in store. However, you really need to make sure that you’re looking closely into other countries that you might have overlooked. That’s the point of this series, anyway — to give you more to look forward to, one step at a time. You need to make sure that you check out Singapore, an incredible country that has plenty to do and plenty to see. Since we haven’t given you a country wide guide in a long time, we figured that we’d get things cooking again nicely. It’s all about knowing what you’re getting into. When it comes to Singapore, you need to remember that it’s actually a city-state. It’s a country, but it’s really focused on one city and that’s it. However, this is a city that has well over five million people, and more people are coming every year to call this place home. It’s very densely populated, but there are other characteristics of Singapore that truly make it special. This is a city covered by greenery, which is something that a lot of urban centers just can’t claim. You start worrying that you won’t fit in, only to find that you’ll actually fit in just fine. There’s nothing to worry about. There’s nothing to prove — just come in as a tourist and figure out which part of this massive, sprawling city that you want to enjoy. There are well over 50 parks within the city limits, and there are also 4 beautiful nature reserves. If you’re someone that feels deeply connected to nature, it’ll be like getting the best of both worlds. What’s important to realize about Singapore is that there are lots of sections within the city. They can often be seen as their own little towns, they’re really that big. For example, you could probably make a trip out of visiting the Central Business District and Riverside, with is where a lot of Singapore’s museums and statues are. Property in France is really hot right now, and thousands of people from the UK are making enquiries about investing in, and purchasing properties. Whether you’re looking for a home-share for the summer, or want to buy a property outright so you can visit it any time you like, there’s more than enough on offer in France thanks to the continued construction industry boom. France is a big country however, and it can be difficult narrowing down your search to a certain area. Let’s take a look at some of the best up and coming locations in France to buy property this year. Honfleur can be found on the bank of the River Seine, and is a small town with beautiful architecture. Situated just by the river, you can guess that views are simply stunning, and this has caused a lot of interest with domestic as well as international buyers. Although the price might be slightly driven up by this interest, the atmosphere and general feel of the town stays the same, and if you catch the shoreline on a warm summer’s day, you’ll even be able to go paddling in the river, as winter temperatures are too cold. It’s hard to resist such a charming neighbourhood, so if you’re thinking about moving to Honfleur, then be sure to make enquiries with local estate agents. Charente is another beautiful and upcoming property location in France, and can be found in the Poitou-Charentes region. This quiet and sleepy town bears the name of the Charente River, which goes through the two closest towns Angouleme and Cognac. Charente is a far cry from city life, and if you enjoy the simple things like fine wine, great food and wonderful people, then Charente is the place for you. Although this town area does experience some tourists, numbers are small, and unless they venture off by themselves, they’re kept to the obvious touristy parts of the town. If you enjoy the sea air, then there’s nowhere better to invest in a property than in Sete. This lovely town is perched right on the coast, and one of the best things about it, is that it has no tourist features – so you’re not going to be overrun with visitors in the summer! There is one attraction in Sete, and that is the town itself. With stunning beaches, golden sands, warm waters and charming properties, it’s no wonder why this area has slowly crept up the most-wanted properties list. Rent a car in France this year with Auto Europe. Morbihan is a classic French town, and it is known all over the country for its historical elements rather than its property. Still, Morbihan offers a lot for those people looking to get away from it all, and you’d be surprised at home many people have been enquiring into available properties here. Local attractions include big hills to hike as well as cycle up, and there are even some mountains in the distance that you can climb.